Please circulate this Redrow Land at Park Avenue consultation leaflet to all your contacts ahead of the Redrow Public Consultation Event on 16th Sept from 2pm to 7pm at Greenbank Sports Centre, Greenbank Lane Liverpool L17 1AG. 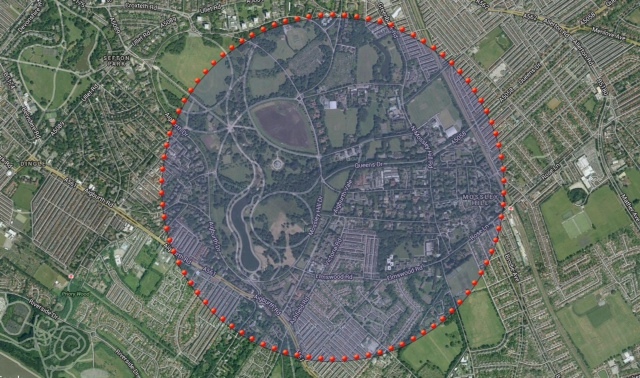 See their map below, showing the distribution area for the leaflets – only 5,700 are being produced for the immediate Mossley Hill Area. Sefton Park has a massive catchment of users and visitors across the north and south of the city. Why aren’t they being directly asked to attend and give their views? Posters will only be put up locally too. Their press release will go out soon. Redrow has hired a top London and Manchester based PR company specialising in land and property deals to run this event, so it will be a slick affair! They say they will run a strong media campaign – listen up and if they are on a phone in – call and give them your views. Charlotte Morris of Lexington Communications states in an email, “we are more than happy to provide information to those who cannot attend the exhibition, as well as allow them to provide their feedback on the plans”. She also adds that “we can also send information by post to anyone who cannot make it to the exhibition or readily access the internet.” Contact Charlotte.Morris@lexcomm.co.uk if you wish or phone their community information line on 0844 556 3002 (Monday to Friday, 9.00am to 5.30pm). so please bookmark this site now. It will go live ONLY from 16th Sept for you to view and comment on Redrow’s ‘exclusive’ homes proposals. DON’T BE FOOLED! THIS IS NOT A CONSULTATION PROCESS. This is simply a PR exercise by Lexington Communications to promote the executive housing development and ‘soft peddle’ the designs in order to get support for the planning application to Liverpool City Council, which is coming next. It will be interesting to see how they go about their task. Is their objective to show support in the community for the proposals? How might they do this? A guess: By focussing on the need for housing in the area, by trying to demonstrate that the proposal still leaves plenty of green space (even if it is in gardens), by trying to show that the proposal enhances the setting in some way (e.g. defining edges), by showing that the proposal is in keeping with the area perhaps through materials and building styles borrowed from nearby housing? All possible. They will fish for positive comments which can be selectively used to build a case even if it means taking them out of context. Then maybe by pulling out from the process some figures showing how many people support the proposals. Alternatively they may just do the whole thing as blandly as possible, ticking the consultation box without trying to fan the flames. SAY NO TO ANY HOUSING…. MEADOW NOT REDROW…. THIS IS NOT A DONE DEAL…. Categories: Objections, Planning Process | Tags: council, environment, green, health parks, housing development Liverpool, Lexington, Lexington and Redrow, Lexington Communications, Lexington Land Advice, Lexington London, Lexington Manchester, Lexington Property, liverpool, Liverpool City Council, Liverpool greenspaces, Loss of Open Space Notice Liverpool, Loss of openspace, meadows, Redrow consultation, Redrow consultation the Meadows, Redrow Homes in Liverpool, Redrow Public event, Sefton Park, Sefton Park campaign, Sefton Park Meadows campaign | Permalink. We were invited as the Meadows campaign to speak at an informal meeting on Thurs 17th July at Ullet Road Unitarian Church. New Green Party councillor for Greenbank Ward, Lawrence Brown, wanted local people to come and meet him informally – and hear from the Meadows, which he described as ‘one of the most important doorstep issues’ in Greenbank, helping him gain election for the first time. The meeting was lively and well attended. Meadows campaigners were led by local Avenues resident Janet Pell. Cllr Brown was joined by another new Green Party councillor Tom Crone from St Michael’s Ward, who will now sit on the Council Regeneration Committee – the key group that was supposed to scrutinise green space sell off. 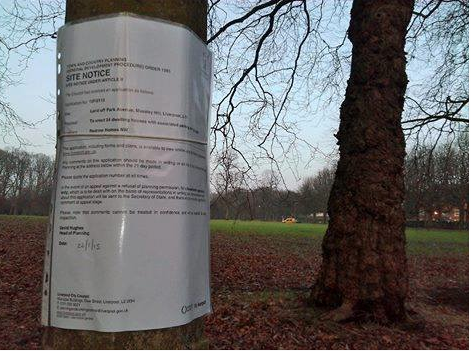 Both pledged their continuing support to stop this heritage greenspace in Sefton Park being sold for housing. We also met a student at Hope University who is writing his dissertation on the Meadows as part of his Environmental Management degree. People filled in questionnaires to support his survey work. Sincere thanks to Angela, Hilary and the great people at the Unitarian Church. 1. We believe strongly that Redrow Homes are the preferred developer. We want people to contact Redrow – and their Chief Executive Steve Morgan to ask him to confirm or deny, and say why they object to housing on this beautiful and unique part of Sefton Park. Ask them to CONFIRM OR DENY! 2. We need to fundraise £1,500 to pay for professional legal and planning advice. Redrow will submit a planning application for the Meadows in early September, and we need to be ready. We are starting to draft our submissions BUT WE NEED PROFESSIONAL HELP. And this will cost us money! Please donate using our PAYPAL button lower down this page. Share this on your own Facebook & Twitter Accounts. Please, let us know what actions you are taking to stop the Meadows being sold off. Time is critical now and we need all the help we can muster! Leave a comment or message on this website or post on Facebook. THANKS. Categories: IDEAS, Planning Process | Tags: campaign, Cllr Brown, conservation, council, disposal, environment, green, Green Party, Greenbank Ward, health parks, housing development Liverpool, Lawrence Brown, Liverpool greenspaces, Loss of open space, Loss of openspace, meadows, parkland, Sefton Park, Sefton Park Meadows, Sefton Park Meadows campaign, sell off Liverpool | Permalink.